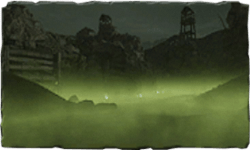 This area contains many powerful casters and poison pools which are dangerous to explore in without the appropriate gear, it is best to take ones time and proceed slowly to avoid a surprise attack which leads to death by poison. The Heirs of the Sun covenant can also be found in this area. Use a torch while exploring the caves with poison, so it will be easier to see where you are going. Harvest Valley is filled with poisonous areas and obstacles, so come prepared. From the Skeleton Lords boss area in Huntsman's Copse, head through the doorway in that room and continue on a path leading to a raised bridge. Pull the lever on the right to lower the bridge and cross over into Harvest Valley. As you move along the rocky pathways you will soon encounter a pool of poison to your right blocking a cave which harbors the first Bonfire. Defeating the boss in Earthen Peak will drain the pool is drained. However, as that comes later, cross quickly but don't roll as that covers your entire body in poison rather than only your legs. 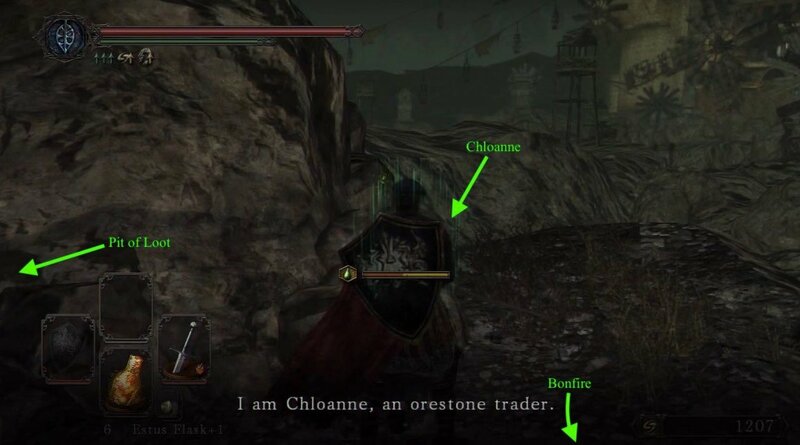 Once you've used the bonfire, head back across the poison pool, and up the right side the hill to encounter the NPC Stone Trader Chloanne . Exhaust her dialogue to move her to Majula. Head through the small archway in the middle of the lakes wall and kill the skeleton to your right. Circle around the left of the poison pit to loot a corpse holding a Fragrant Branch Of Yore and a Torch. 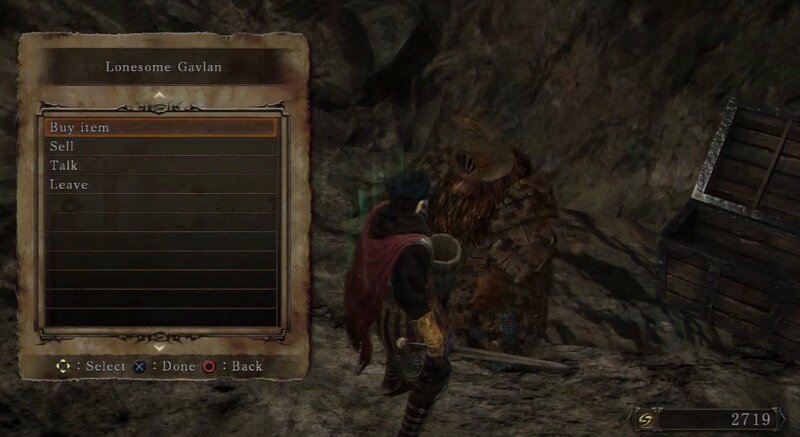 Continue along the ledge and enter the hole in the wall to find the NPC Gavlan (If you talked to him previously in No Man's Warf ). Behind him is a chest containing Raw Stone. Exiting this room, in this same cave, down in the mist, there should be a small alcove to the left of the slope leading down. In here you'll find a chest containing a Fire Seed and a Divine Blessing. Leave this cave, back out to the open and head up the slope to where you found the single Torch. Continue along and you'll arrive to the greetings of two Hollow Pyromancers; one on a ledge on the left, and another on a higher platform at the back. Climb the ladder that you first come across on the right for a better vantage point and 10x Hexing Urns. You will also find multiple Undead around the area. 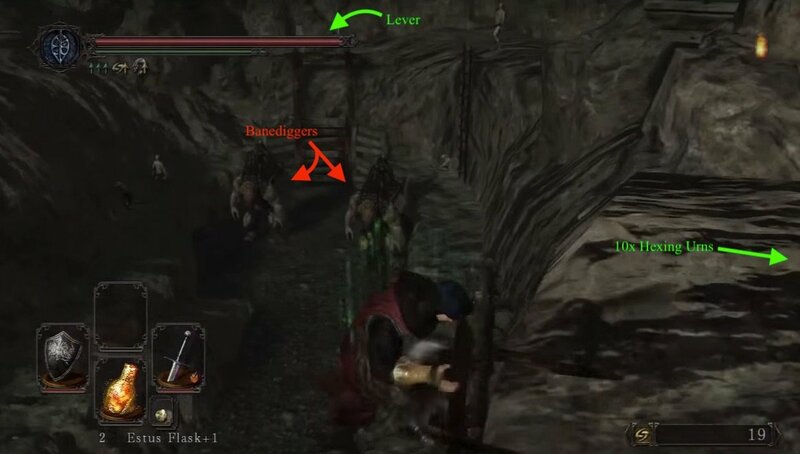 Climb the second ladder on the right to arrive at where the second Pyromancer is/was. You'll find a lever you can pull to raise the wooden gate blocking the exit. Head through and turn right to reach the second Bonfire. Past this bonfire, you'll come upon a small quarry with several holes filled with poisonous gas. Here you'll find three Crystal Lizards. This is quite convenient, as if you miss any of them, you can easily go back to the bonfire, rest, and try again, without traveling a long distance or having to face any enemies in the process. Along the left wall is a path leading up to a boarded off area, and an opening on the right, ignore the opening for now. Near where the Giant was is a small ledge you can drop off, onto a chest containing a Poison Stone and 3x Rotten Pine Resin. The only way out is down into a gas filled tunnel with a Soul of a Nameless Soldier. At the end of the tunnel is a ladder leading back to the small quarry. From here, return to the path with the Banedigger and enter the opening we ignored earlier. One of the boards hides 2 Hollows. Another board hides a tunnel that has two exits: one lead you to a Petrified Something on a ledge overlooking a small quarry, and the other brings you to a Crystal Lizard then a pit which jumping into will lead to death. So take the lizard then head the other way. Once back up the ramp continue up the path and confront the hammer wielding Steelworker Undead near the plank bridge. After he's dealt with, cross the small wooded bridge, head up the stairs and down a path to the left under a windmill blade. Continuing on into a tunnel, you'll come upon a broken statue drenched in sunlight. It is similar (exactly the same?) 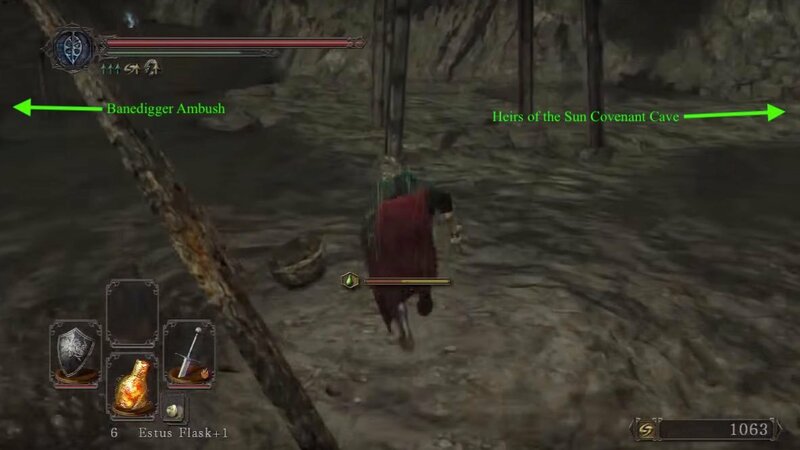 to the one in Dark Souls 1 and allows players to join the Heirs of the Sun covenant and learn the 'Praise the Sun' gesture. Returning to the bottom of the stairs near the bridge from earlier, you can take the path to the right which curves left and to a room full of poison urns. Take it slow: a Steelworker Undead will aggro as you approach, breaking a few urns which spew poison in the process. Just let him come to you. There's another Steelworker Undead waiting for you inside the doorway on the left. 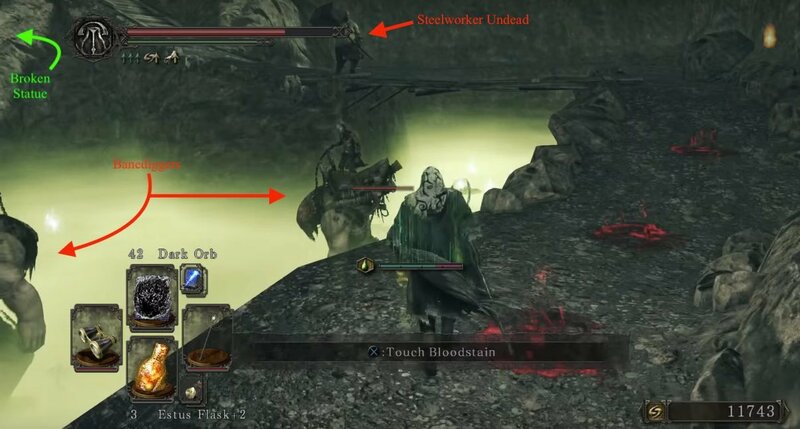 Once in the room, you'll see a ladder which accesses a higher walkway in the same room with yet another Steelworker Undead on that level; to pull him, go back out to the bridge and straight up to the top of the stairs -- this is another entry to the same upper walkway. He'll aggro as you approach him. Once all the mobs are dealt with, head back into the room. From here, there are two entrances to Earthen Peak: the ladder, and the other straight out the doorway. 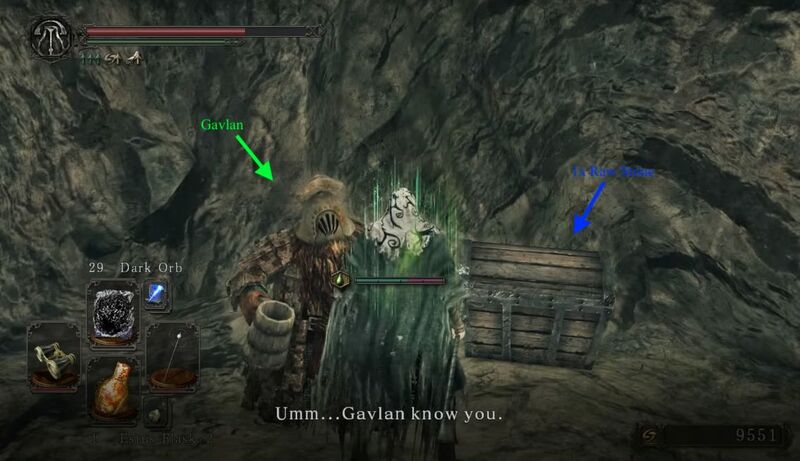 Take the lower route If you're eager to get the nearby Estus Flask Shard in Earthen Peak for details. If you have lightning or ranged attacks, it's very easy to farm the giants that spawn near the Mines bonfire (2nd one) for 750 each. 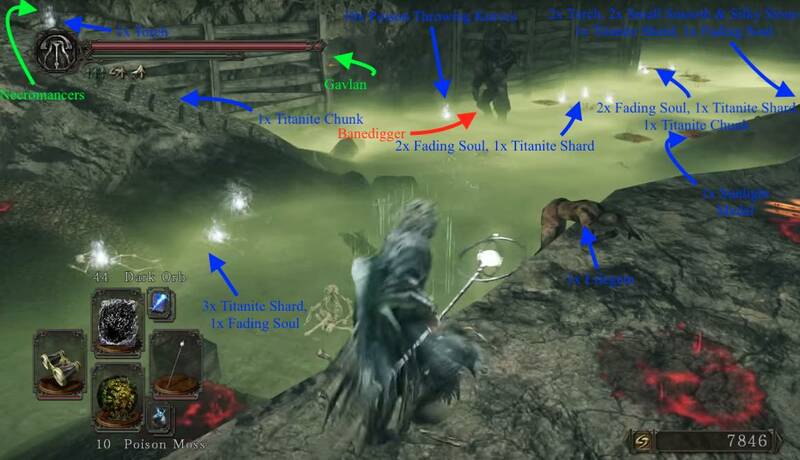 If you go the extra step of killing the two just past the quarry after the bonfire as well, you can get 3k souls or more very quickly with little time/effort and just a few lightning spears/dark orbs/any form of ranged attacks that deal roughly 200 damage minimum. From the Skeleton Lords boss area in Huntsman's Copse, head through the doorway in that room and continue on a path leading to a raised bridge. Pull the lever on the right to lower the bridge and cross over into Harvest Valley. As you move along the rocky pathways you will soon encounter a pool of poison to your right blocking a cave which harbors the first Bonfire. Defeating the boss in Earthen Peak will drain the pool is drained. However, as that comes later, cross quickly but don't roll as that covers your entire body in poison rather than only your legs. Once you've used the bonfire, head back across the poison pool, and up the right side the hill to encounter the NPC Stone Trader Chloanne. Exhaust her dialogue to move her to Majula. Leave this cave, back out to the open and head up the slope to where you found the single Torch. Continue along and you'll arrive to the greetings of two more Banediggers in the small valley. Climb the ladder that you first come across on the right for a better vantage point and 10x Hexing Urns. 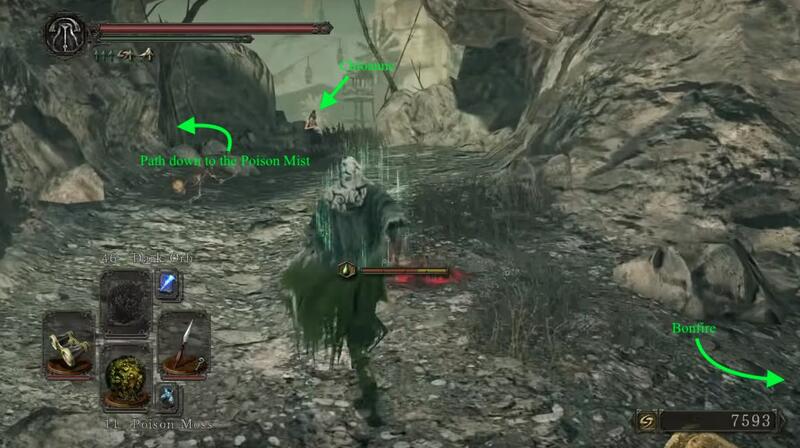 You will also find multiple Undead around the area. Climb the second ladder on the right to arrive at a lever. Pull it to raise the wooden gate blocking the exit. Head through and turn right to reach the second Bonfire. Past this bonfire, you'll come upon a small quarry with several holes filled with poisonous gas. Along the left wall is a path leading up to a boarded off area, and an opening on the right, ignore the opening for now. One of the boards hides 2 hollows. With loot in hand, head for the exit tunnel. At the next intersection go left to find a Crystal Lizard. Run in and dispatch it quickly, but do not follow if it falls into the hole. Dropping down will instantly kill you. Going the other way you will find yourself on a ledge overlooking the small quarry. Loot a Fragrant Branch of Yore from the body near the edge. Once back up the ramp continue up the path and confront the hammer wielding Steelworker Undead near the plank bridge. After he's dealt with, cross the small wooded bridge, head up the stairs and down a path to the left under a windmill blade. 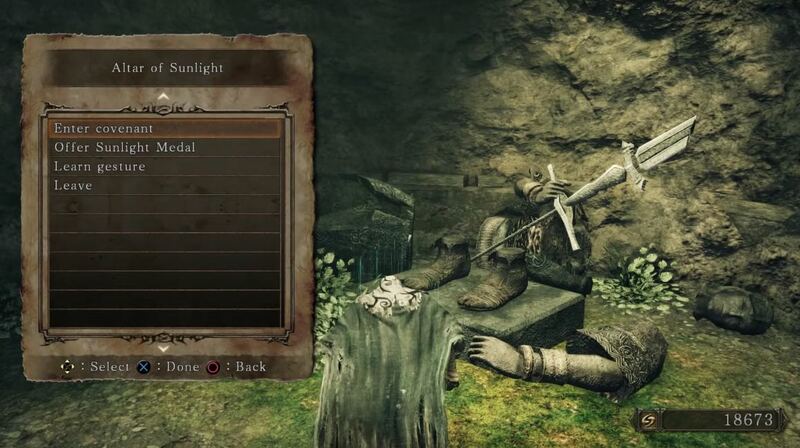 Continuing on into a tunnel, you'll face an executioner before you'll come upon a broken statue drenched in sunlight. It is similar (exactly the same?) 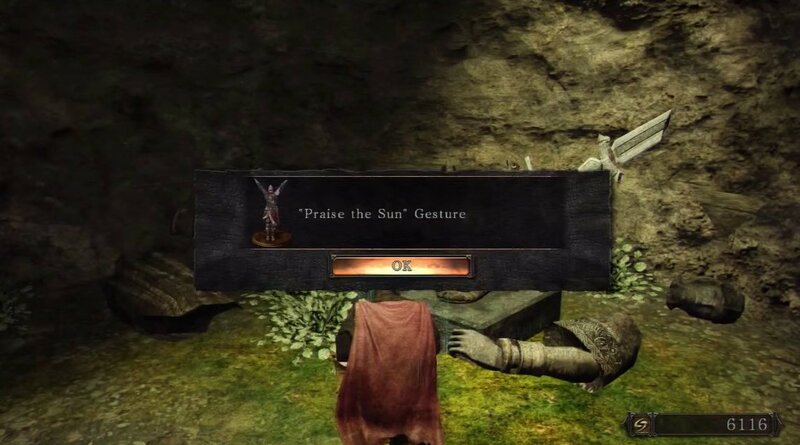 to the one in Dark Souls 1 and allows players to join the Heirs of the Sun covenant and learn the 'Praise the Sun' gesture. In this line: "Loot a Fragrant Branch of Yore from the body near the edge", the item is incorrect. In my game, it was a Petrified Something. 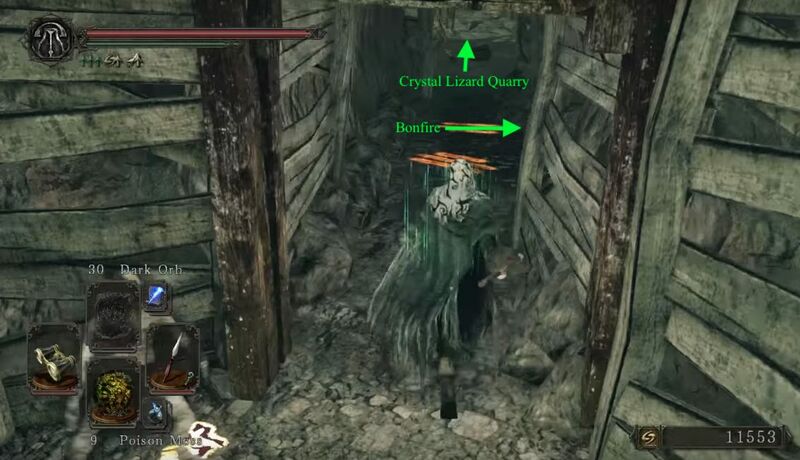 Just wanted to add for the SoTF version, there are now 3 Crystal Lizards just after the second bonfire. You can kite the one in the middle from afar, then slowly move out of the tunnel and range the other two before they both notice you and run away. Right at the point when you turn left to the sun covenant, drop down to the mist to get a SLAB. The Lost Sinner isn&apos;t the boss of this place? ?